You didn’t think I was going to just have these movies compete against each other in these one-on-one battles for the last few months without making it into something much more organized and annoying, did you? Regardless of what you thought, I did. I did it because it’s one of the few opportunities I have to combine my four favorite things: movies, sports, writing, being pretentious. So I’ve taken every movie that I’ve watched since coming up with the idea and pitted them against each other, simply based on which two movies I watched most recently. NOW, I’m organizing them into a bracket of 64 to compete in an NCAA basketball-type of tournament to determine the greatest movie OF ALL TIME (of the last 64 that I’ve watched). It’s not very exciting, I’ll admit. But one overriding factor you have yet to account for – is that I don’t care. I’m doing it. 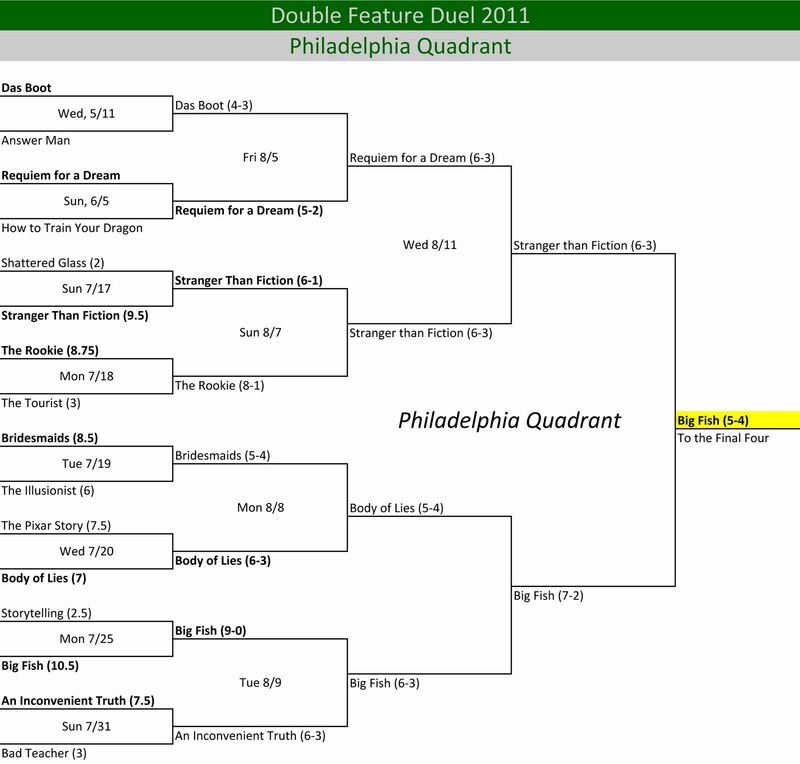 And the first 16 movies have been watched, thus enabling me to finish off the first quarter of the bracket, what I’ve decided to call “The Philadelphia Quadrant.” Follow along to see if your favorite will make it to the Final Four, scheduled to take place anytime between Thanksgiving and next Thanksgiving. The number next to each movie on the left side is their “bug scale” ranking. For simplicity sake, just assume that means it’s their Dustin ranking out of 10. The subsequent numbers is the score of their previous victory. And the greatest thing about this is that I can do this during work and people who just glance will assume I’m doing work. Awesome! 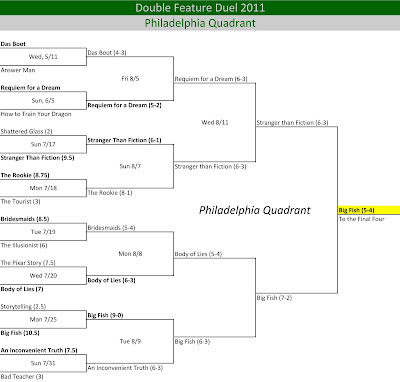 So how does this prognosticator see The Philadelphia Quadrant shaping up? Well, based on the bug scale and knowing myself more than a little bit, I’d say it’s a likely bet that Big Fish will meet Stranger Than Fiction in the finals. But, these categories don’t always make for a cut and dry winner. That’s why they play the games. Speaking of which, in the immortal words of Marvin Gaye, let’s get it on.